Roasting cauliflower brings a deep, nutty flavor to this traditional veggie. Tossed with some hearty Israeli couscous, sweet golden raisins, and tangy pickled shallots, this side dish almost steals the show. If you have a blender, our optional romesco sauce is a delicious twist that takes the meal to the next level. Preheat the oven to 400 degrees. 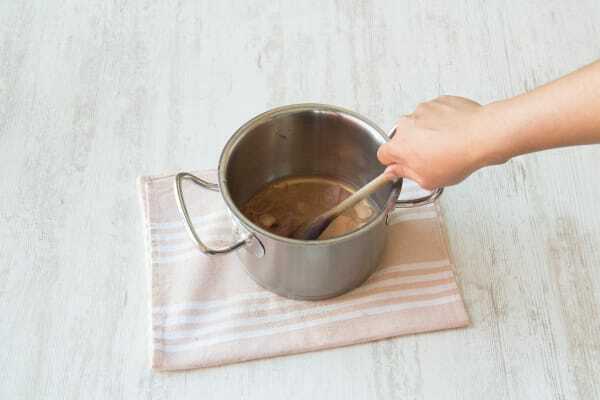 Bring a large pot of water with a large pinch of salt to a boil. Pick the parsley leaves from the stems and discard the stems. Cut the cauliflower into bite-sized florets. 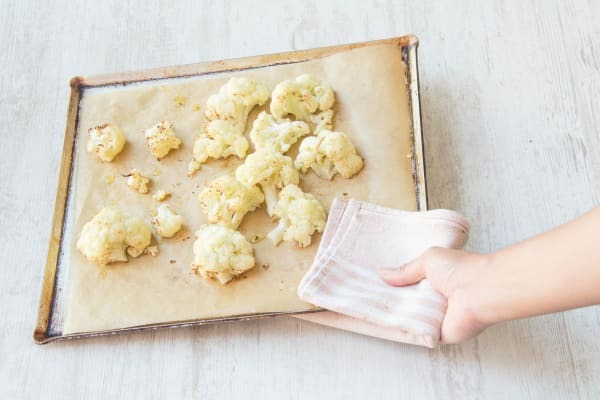 Toss the cauliflower on one side of a baking sheet with 1 tablespoon olive oil and season with salt and pepper. Place in the oven for 20-25 minutes, until soft and golden brown. Thinly slice the shallot into rounds. Smash 1 garlic clove with the flat of your knife. Core, seed, and remove the white ribs from the bell pepper, then thinly slice. Halfway through cooking the cauliflower, toss the bell pepper with a drizzle of olive oil and a pinch of salt and pepper on the opposite side of the baking sheet with the cauliflower. Return to the oven for the remaining 10-12 minutes, until soft and slightly charred. Meanwhile, add the Israeli couscous to the boiling water and cook for 7-9 minutes, until al dente. Drain and rinse under cold water. Pickle the shallots: in a small pot, bring half the vinegar, the shallots, and 1/3 cup water to a boil. Remove from heat and let sit for 2-3 minutes then remove the shallots from the pickling liquid. OPTIONAL step for romesco sauce: mince remaining garlic clove. 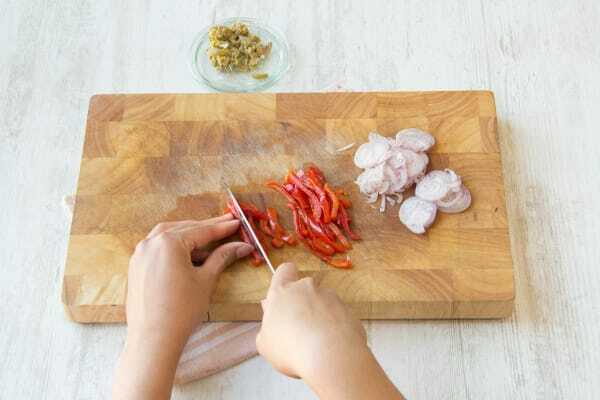 In a blender, blend together the roasted red peppers, almonds, minced garlic, remaining vinegar, half the paprika, 1/3 cup water, and 1 ½ tablespoons olive oil. Blend until smooth, then season with salt and pepper. Heat 1 teaspoon olive oil in a large pan over medium heat. Season the steak on all sides with salt, pepper, and paprika. Add the smashed garlic to the pan and cook for 30 seconds, until fragrant. Remove and discard garlic. 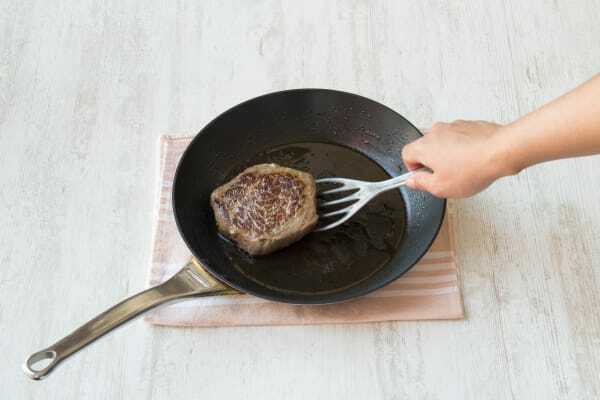 Add the steak to the pan and cook for 4-7 minutes per side, until cooked to desired doneness. Set aside to rest for 5 minutes. Make the cauliflower salad: in a medium bowl, toss together the roasted cauliflower, Israeli couscous, golden raisins, parsley leaves, pickled shallot, and, if you did not make the romesco, the roasted red peppers and almonds. Toss with a drizzle of olive oil and season with salt and pepper. Thinly slice the steak against the grain. Serve alongside the cauliflower salad. 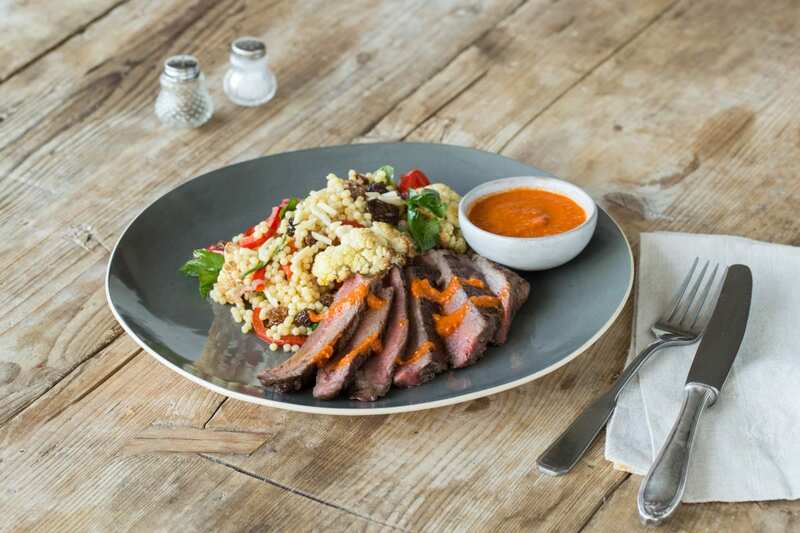 Drizzle the steak with the romesco sauce (if made) and enjoy!